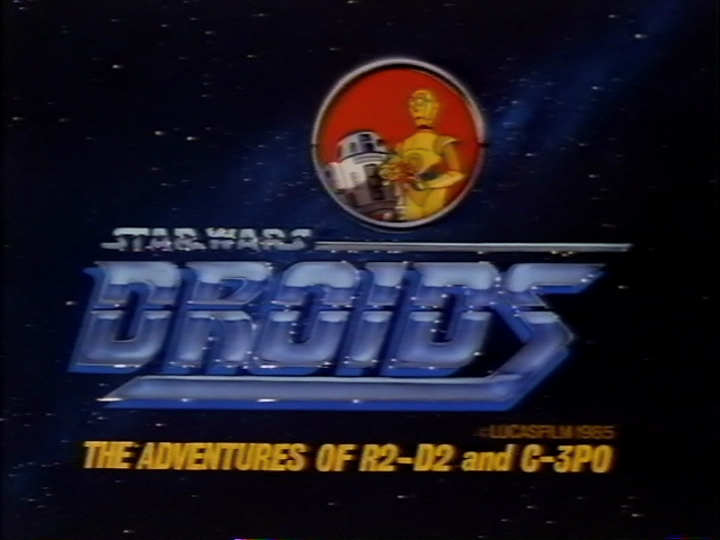 We all know how terrible the DVD releases for Droids and Ewoks were. They were cut up, mangled and all together different. 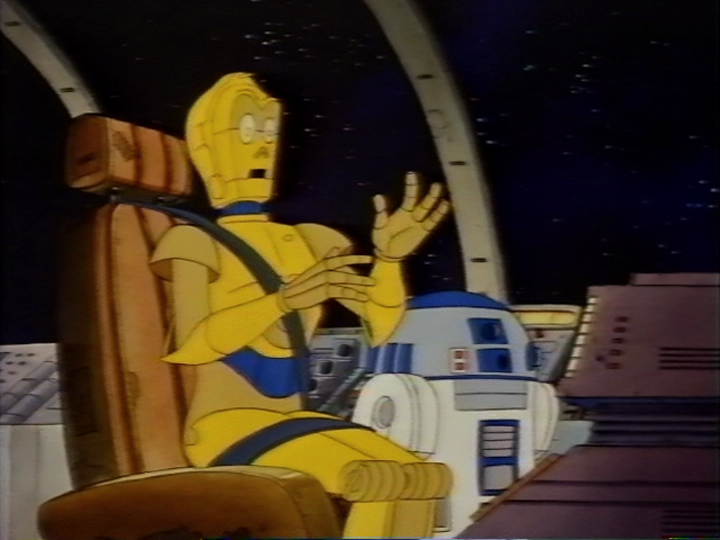 This set is the culmination of about 3+ years of tracking down foreign tapes to find the best sources possible for the original Droids animated series in full. And then syncing them up with English audio tracks that contain the original sound effects and music as they aired in 1985 and 1986. The set will include UK PAL VHS tapes, Japanese NTSC VHS tapes, as well as original TV broadcasts. At first I had just collected the PAL tapes in hopes of making a direct transfer but I (along with a number of other people here on OT.com) found them to suffer from some terrible frame blending. The NTSC->PAL transfer done by CBS/FOX was atrocious. No amount of IVTC or deinterlacing appears to help. But then I was made aware of the Japanese NTSC tapes. It took me months and months to finally track them all down but fortunately I was able to get them and they do not suffer from the frame blending problem. So the plan is to use the Japanese tapes for the video and the PAL tapes for the English audio. 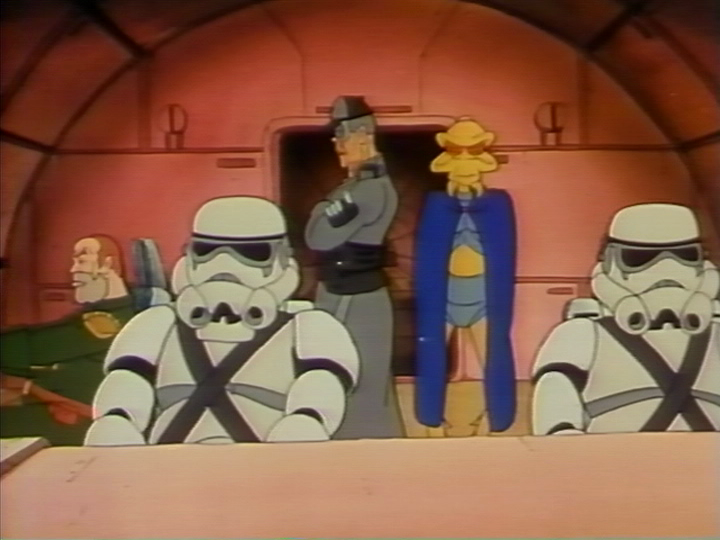 The main problem at the moment is there is no Episode 9 “Coby and the Starhunters” on either the UK PAL tapes or the Japanese NTSC tapes. The only source that I have at the moment is a recording of the original broadcast on ABC. The broadcasts from the SciFi channel will not suffice as they have been edited down by a few minutes. The only commercially available source of this episode (to my knowledge) is a Mexican NTSC VHS release that has proven near impossible to track down. The copy that I have is not the best in the world but it will have to do for now. The other problem being that there is no Japanese release of the Great Heep. (Edit: this turned out to not be true. See post on page 6) Again, there is a Mexican NTSC release of this episode that is impossible to track down and the SciFi channel airings were edited. I plan on using the UK PAL tapes as a source for the time being. Then I have been using minimal Avisynth and Virtual dub filters to just perform IVTC, light leveling to brighten the image and slightly darken the blacks, and some light denoising. I am trying to do as little “improvements” as possible. I will then piece together the audio track in Sony Vegas and save the audio as an AC3 file and then merge it with the AVI file. The 1.0 version of the project will be uploaded as an MKV set with AC3 audio (incase anybody wants to make their own DVD set you are already half way there). Version 2.0 will come later on down the road when I get a commercial version of the Coby episode as well as The Great Heep. This could takes years at the rate it is going. I will then likely make a DVD set. 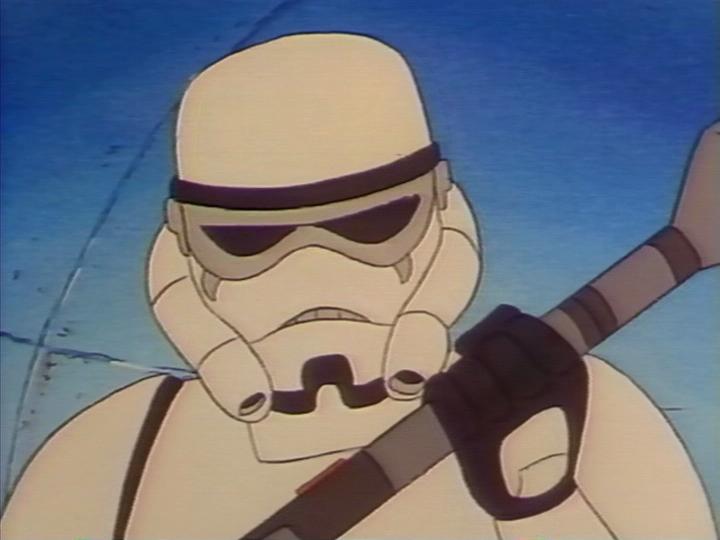 And I would just like to state upfront that these are VHS rips. They are only going to look so good. All of us will be able to find plenty of defects and eye sores with little effort. But I really have no ambitions of laboring over them in Avisynth for the next couple of months. Trust me, with 14 episodes totaling almost 400 minutes…it is a huge time-sink. But if there is somebody around here with tons of experience and a proven track record then I would simply offer up my raw AVI files to them to make their own set. 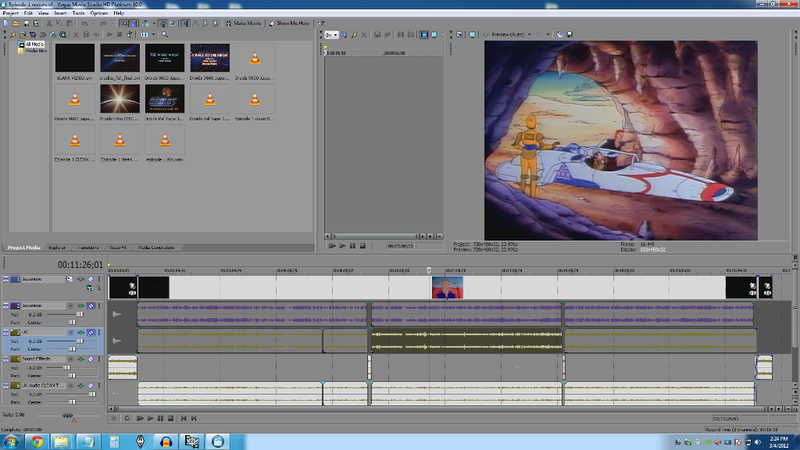 The audio sync alone has proven to be quite the undertaking. The UK PAL tapes repeatedly trim seconds off near commercial breaks and fadeouts in an attempt to make it feel more like a movie. I have been using some clips from the original broadcasts and the SciFi airings to fill in some of the shortcomings. All in all, I think it has turned out pretty good. 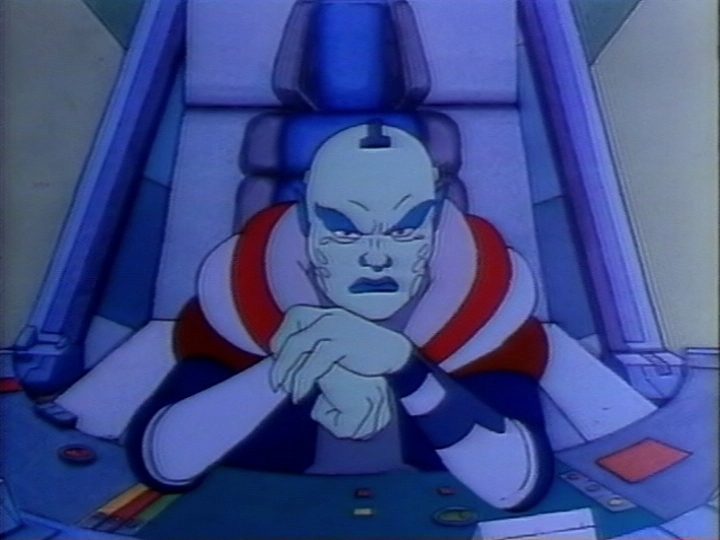 I am just about done with the Japanese/UK mixes and will soon be focusing on the Coby and Great Heep episodes. Here are some clips from the Great Heep UK PAL tape. Does anybody have any ideas as to how best to proceed with deblending these frames? 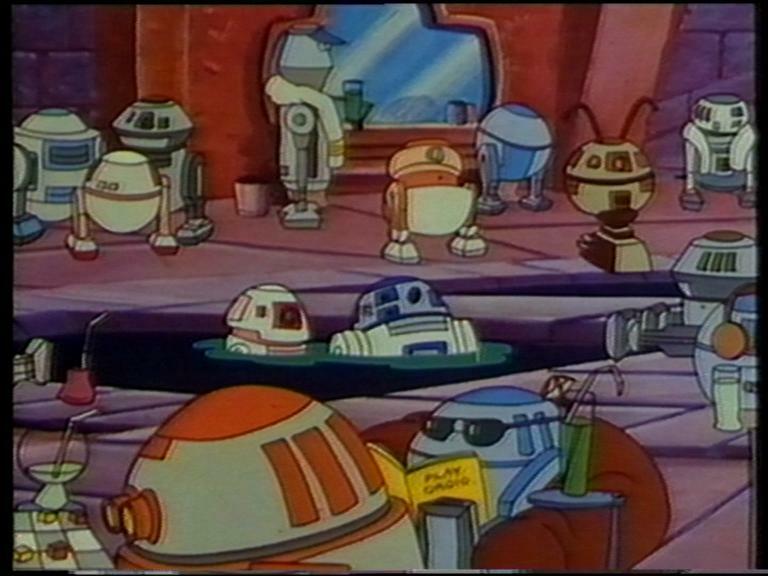 We played around with them a little in the previous Droids&Ewoks thread but it looked a little hopeless. The frame blending is just out of control. 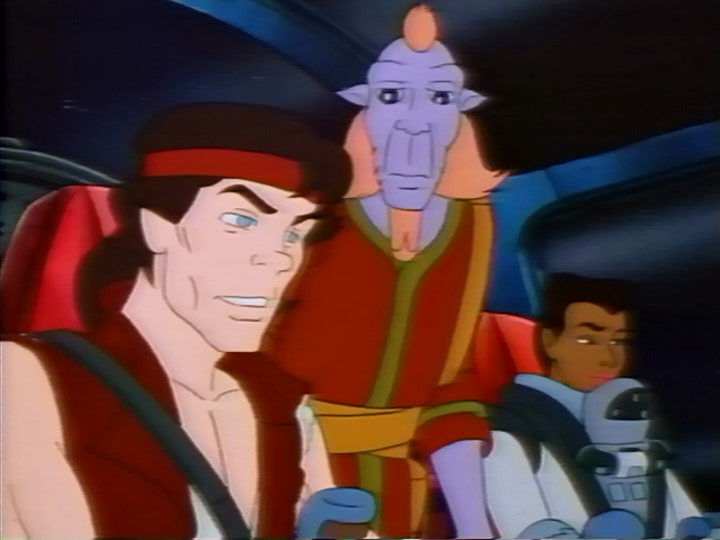 I am leaning towards just a straight de-interlacing and settling on a 25fps version of the Great Heep. Concerning the Coby episode, I have a DVD made from a VHS. For some reason I am having the hardest time getting the sucker to deinterlace properly in Avisyth/Virtualdub. There is this weird combing effect. I have tried just about everything. Wonderful, Ed. Great work ! Great..! Finally Droids get some love, too. Looks very good, these Japanese tapes are definitely the way to go. I can see a little of the haloing that you mentioned in a previous thread, but it's not really noticeable. My media player (MPC-HC) played this back at the wrong AR, not sure if that's the fault of my player ignoring the aspect ratio flag, or if you didn't set it in the MKV in the first place (I didn't have time to check). Since compatibility with AR flags generally can be hit-and-miss, I would recommend you resize to 640 x 480 before encoding. Since the source is VHS which has limited horizontal resolution anyway, you wouldn't lose any detail. Maybe consider the use of AAC instead of AC3 for audio, and MP4 instead of MKV for the container (formats that the pirate "scene" is now moving to - look up the SD x264 TV Release Standards 2012). I spent some time looking at this; the best "off the shelf" solution I could find is SRestore with a target framerate of 23.976, which restores some frames, but not all. Odd, I did set the AR width to 640. It displays fine with VLC and my Popcorn Hour in the living room. I wouldn't rule out software weirdness on that one and I agree that sometimes it can be hit-or-miss. I am not 100% certain that I want to drop the size down to 640x480 though. I would like to pack as much detail in there as possible, especially if these encodes last as long as the previous ones did (VCD set from 1990's are still all over the place). In regards to the MP4/AAC suggestion, I was actually just thinking the same thing these last couple of days since the new scene standards have been revealed. I settled on MKV/AC3 a few months ago, but if new hardware over the next couple of years becomes more MP4/AAC friendly (which is likely to happen when the scene decides upon a standard) then that is probably the way to go. I am not packaging multiple audio tracks or subtitles so MKV isn't necessary. So I will probably do some test encodes with MP4/AAC at 720x480 with an AR flag of 640 width and test them out on a few different media players to see if I have any problems. If I run into a bunch of incompatibilities then I will look into trimming them down to 640x480. Have you tried the AnimeIVTC plugin for avisynth? I've had luck with it sometimes. After finding the right settings I always make sure killcomb is set to 1. SRestore seems to break down during scenes that pan and zoom. When the camera is stationary though it has great results. I played around with some of the parameters all with the same result. Sample 2 has some very visible pan and zooms, but if you want another example with more let me know. Yeah, I have played around with AnimeIVTC quite a bit. With no good results so far. It either multiplies the blending, or removes to much, leading to the same results with the pans and zooms. I really do think this will just have to be a 25fps encode with just boring old de-interlacing. What I may do is render the episode with SRestore, Telecide or something similar. And then just replace the scenes with panning/zoom with a regular de-interlace. The finished product would still have to be 25fps but it is probably the best we are going to get unfortunately. 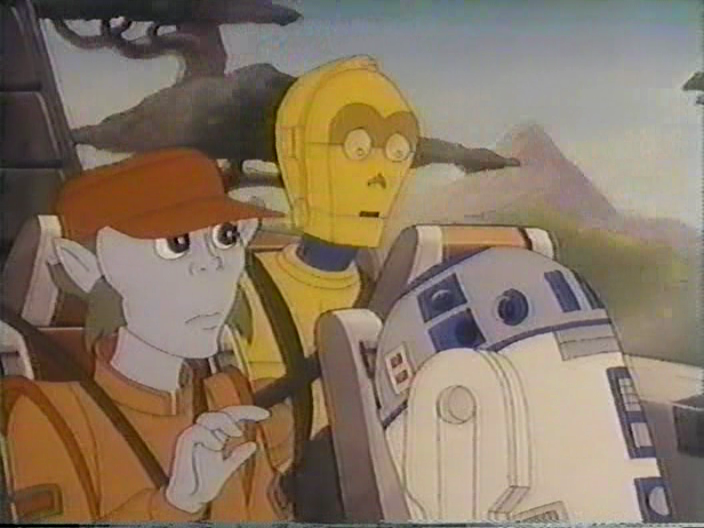 Is there any place you can point me to where I could find out more about this cartoon and why this project is necessary (I thought droids came out on DVD)? Essentially, the series consists of 13 episodes and 1 TV special. But they only released 8 of the episodes on DVD. And those 8 were edited together to appear as 2 mini movies. No intro/theme song. Cut completely. music throughout the episodes are replaced with new compositions. the section surrounding the commercial breaks are trimmed to appear seamless. So no cliffhangers before commercial break. DVDs have all new footage and voice overs in the beginning to replace the intro. minor trims here and there throughout the "movies"
Kind of the same thing that happened with the Young Indiana Jones chronicles and the DVD release. They are no way near the original broadcasts. Also, all of the current sets of the original episodes floating around on P2P and from conventions dealers are abhorrent. Exactly right. The characters are "animated on 2's" - each drawing is held for 2 frames - effectively 12 fps. If you bob the source you can usually find two clean fields from the same frame while the "camera" is static. However, pans and zooms are rendered on 1's (24 fps), some frames end up becoming mangled in the conversion, and there are no clean fields from which SRestore can recreate the original frame. After trying a million different things, I think that I am just going to leave The Great Heep episode at 25fps. I can't seem to get a straight 25fps->23.976fps (no decimate or SRestore) to work without it having a slight hiccup. As it is removing a frame just about every second it gives it a little stutter on pans/zooms. So the plan is to render the episode twice, once with SRestore and once with just a plain deinterlace. I can then edit them together using the SRestore scenes when the camera is stationary while using the deinterlaced encode for the pans/zooms. I think that this should lend the best results, although it will be time consuming. And this sort of rules out a DVD set unless this episode is by itself. Then again, I could probably just convert the footage to 29.97 fps instead of 23.976. That would probably help with the stutter but at the same time introduce even more blending. Once you have the video at 25fps progressive, you should be able to simply slow it down to the desired framerate and then you can do the same with audio and mux it together. I could just take my final project (of mixing together the two encodes) and slow it down. I wonder by how much that would increase the total time for the episode? I have heard the conversion for a 2 hour movie adds on about 5 minutes to the total run time. The runtime for this episode is about 47 minutes. So this would probably add a little over 2 minutes? The original commercial VHS tape wasn't a PAL speedup (as far as I can tell). This was a PAL blend from 29.97 -> 25. So we would effectively be altering the run time. It is food for thought...and something I may wind up doing. 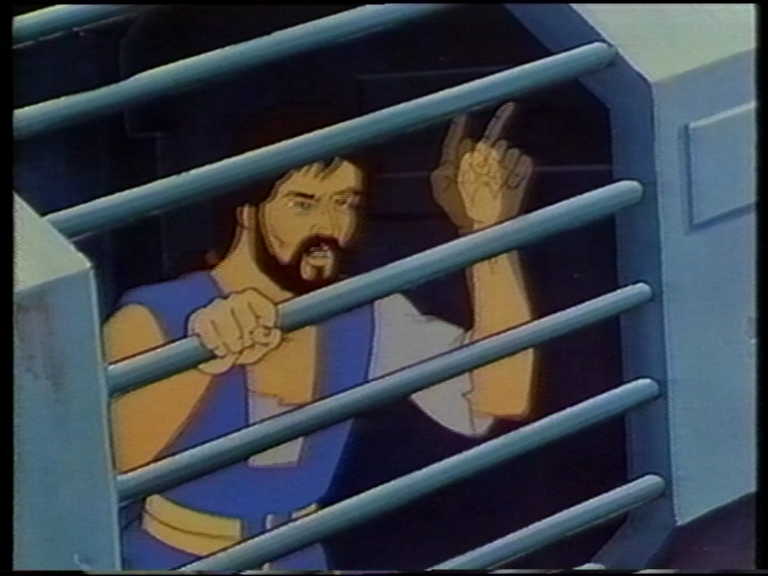 While going through The Great Heep scene-by-scene I noticed this. I am pretty sure that magazine says "PLAY DROID"
LOL! I haven't even seen Great Heep yet so looking forward to this. Really looking forward to this. I was gutted when I watched the dvd's for the first time, one of the things I remember from the series' was the music "trouble again"! Sorry for the long breaks between updates. I finished the Great Heep episode. Using SRestore for standard scenes and then a simple blend for the panning/zooming scenes. It took a while going through the mini-movie scene by scene but the results are pretty nice. It is also now 23.976fps (via slowdown) and 720x480 to keep with the rest of the NTSC set. Here is the video track just to show you how many cuts had to be made. Now I am just waiting to get my Droids 3 tape back from Ringwraith so I can copy the English audio from it with my current setup. 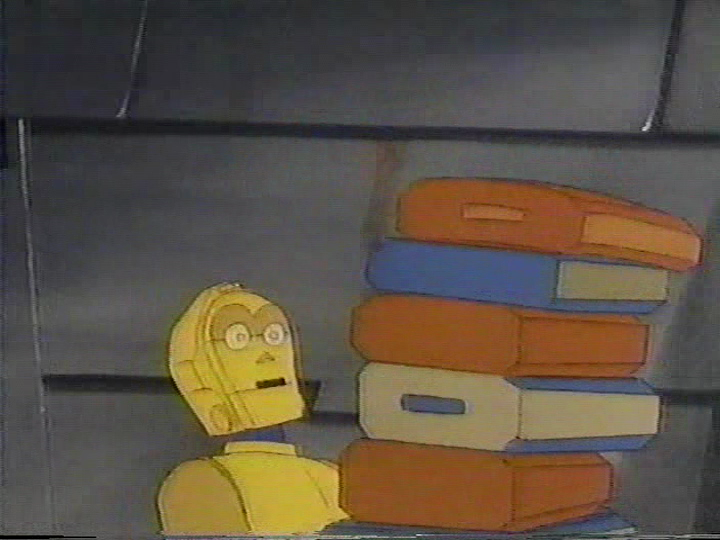 My backup Droids 3 tape that I have is somewhat lacking and has nasty spots all over it. Oh, and I haven't finalized Coby yet but I have been tweaking my process a little here and there for it. And I have been toying with some 640x480 encodes and they do look pretty much as good as the 720x480 encodes. But I have been unable to replicate the AR display problem that Moth3r had. It may be best though to keep the mp4 set 640x480 just to avoid any problems. Remember, I do plan on releasing a DVD set one day when I track down the Mexican VHS tapes. And that will be 720x480. I finished the Great Heep episode. Using SRestore for standard scenses and then a simple blend for the panning/zooming scenes. Yes, that's the solution I would have suggested, but I didn't think anyone would be patient enough to do it. No question about your commitment, Sir. I thank you for doing this, and am looking forward to seeing the results.